It has been great to reflect on what just one small team of dedicated STEM ambassadors have set out to do – and achieved! We saw more than 2000+ bright-eyed students up-skilling in tech know-how for their futures. Including Seniors at City of Stirling libraries and ages 12 – 25+ at City of Swan’s FuturesLab community. 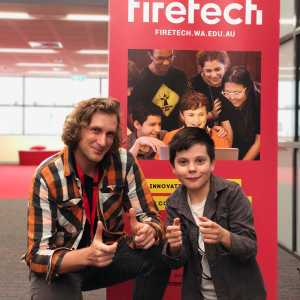 2018 also saw a new partnership blossom with Edith Cowan University (ECU) School of Engineering, whose students have become some of our best tutors yet this year. In the education sphere, we reached out to providing digital technology access for kids of all abilities – in the ESC world too! Special mention to Cyril Jackson Senior Campus ESC for your hard work throughout the entire year! Our education team also switched up the game providing professional learning to teachers across Perth – who are fighting the front-line battle to get kids future-ready, while learning so much on the job themselves. Your perseverance, willingness to learn and work ethic are inspiring. Before we shut down for Christmas the Fire Tech Team collected a selection of our top memories from 2018 – and here they are! Taking a road trip inland to visit some great kids at AASQA-Wasm Coder Dojo – Kalgoorlie. And making the biggest Ozobot map on the floor with masking tape! Making new friends with Lionheart Camp For Kids, distracting families who have recently dealt with the burden of grief and teaching resilience sideways through tech. Coming oh-so-close at 2nd place for the WAIITA awards. Realising how important transforming tech-skills is both inside and outside of education and re-aligning our mission since to keep doing even more. Just having so much fun in the Edith Cowan University (ECU) School of Engineering robotics lab inspiring kids. VR, coding, mechanised robots – we can’t wait to see what the next-gen engineers and scientists bring! Our team also worked hard to release 6 new tech courses. Recieved runner-up in the WAIITA Transformative Education Impact awards. Took a road trip to Kalgoorlie to teach tech to AASQA Coder Dojo Kids! And taught kids, grandparents, and fans how to fly drones at the Optus Stadium for Eagles Fans. This year we are most proud to have more than double our STEAM outreach initiatives to communities all over WA at STEM festivals, volunteer workshops and own #Sheroes animation program. There have been so many small transformations (and some big ones – goodbye “camp!”). But all the effort invested has been leading us ever forwards to our goal: tech skills for all. So that everyone is equipped for their best future. What a transformation… We love our new shiny red branding! What an adventure! It certainly is time to take a well-earned break. Thank you again to our Fire Tech family for an amazing 2018. See you on the other side of New Years! From the Fire Tech Team. January Workshop bookings will still be available to book online. Our office will be closed until January 2nd while our team enjoys a well-earned rest with family and friends. Merry Christmas!